The reason why are you looking for PST viewer is not only the switching to the Mac. Outlook for the Mac also uses the PST files as I know. So there can simply happen you have the backup of the Outlook from another computer or from your old PC. And it may be you wouldn’t continue using the Outlook because you found the Apple Mail is enough for your personal uses. There can be many other reasons. So in all these situations the PST viewer can be useful. If you are Windows user and looking for how to open files from the Outlook Express, check my older article How to open old DBX files without Outlook Express. Here we will stay on Mac OS – the utility we need is called PST Bridge and can be easily installed via the Mac App Store. How to open and read PST files using PST Bridge? Run the PST Bridge and click Open PST button. Select the PST file coming from the Outlook and open it. Then you can view the PST content – mails, contacts or appointments. 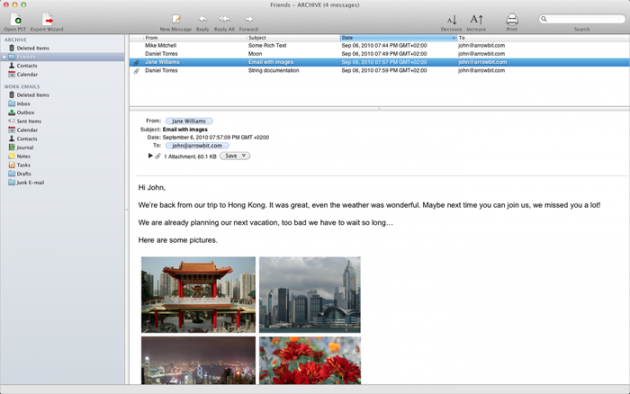 You can browse them like in any other mail client. PST Bridge also supports full text searches over your PST data. The PST Bridge also supports exporting and conversion. To export the PST file data to the Apple Mail you can use the Export Wizard button and save your mails as MBOX files. You can also export the contacts to the vCards. Finally, the appointments from the PST file can be exported directly to the iCal using the PST Bridge. The basic usage of the PST Bridge is for free. However the limitation is only the 10 items per folder viewed or exported. You can unblock this limitation by using the in-app purchase, which is currently $11.99 for the PST Bridge Exported and $18.99 for the PST Bridge Viewer. For more information point your browser to the PST Bridge homepage.